Package Configurations - What Does 'Configurable' Mean? Setting whether a package item is configurable dictates how much control your customer has on specifying exactly when they want to book a package item. If a package item is not configurable then the customer has no control over specifying exactly which days they would like to add the item to their booking. The item will appear with a single checkbox - if it is selected then all days that are set as an option in the package settings will be added to the booking. And the reverse is also true - if the item is not selected then the package item will not be added to the booking at all. If a package item is configurable then you are giving the customer full control over exactly which days they would like add to the item to their booking. On Activity Level you can set different time slots for your activity. 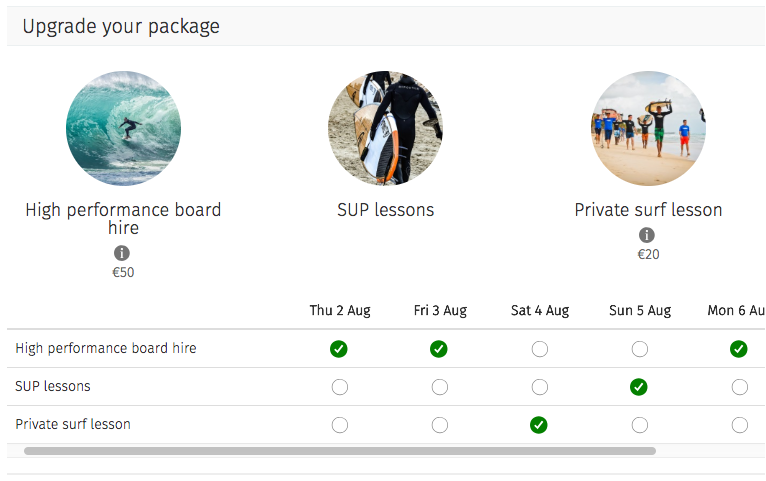 On Package Level you can set rules on when an activity can be booked.